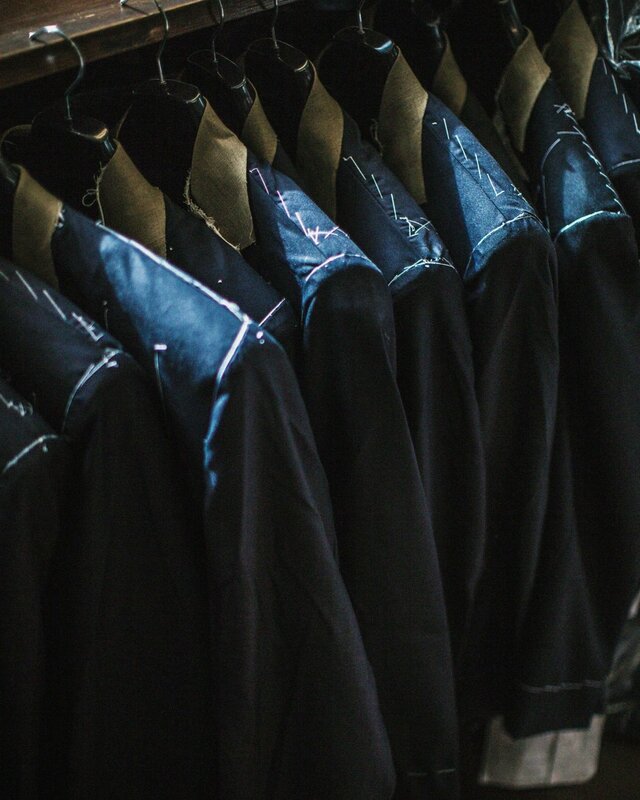 "Bespoke tailoring is a counter movement to the increasingly fast-moving consumption in the world." Walking through any shopping centre these days I think we all feel a little sting of worry. The amount of items; garments, home electronics, shoes and other products, that are being churned out by the minute is staggering. We humans all seem to have a built in evolutionary strive for improvement, prosperity, and well-being that easily translates into the consumption of “things” in our days. Black Friday’s, Christmas Sales, Summer Sales, and a constant drive from merchants to incentivise our purchases drives consumers to buy a lot of things we don’t need for the reasons we don’t know. And to be honest, most of us already know that this isn’t sustainable. We meet with a slight feeling of shame and guilt at the recycling centre to dispose of our old packaging, some almost never used garments, home decorations that have gone out of style, and the Christmas or birthday presents we never liked. We know that the price of what we buy today probably is too low, and that the effects of our consumption eventually will be paid by coming generations. In line with the famous quote by oil fireman Red Adair, “If you think it's expensive to hire a professional to do the job, wait until you hire an amateur”, it is clear that real quality will pay off over time. Both for your wallet and for the environment. The amount of raw materials, water, and energy that goes into producing textiles is significant and hence the longevity and number of uses of the cloth will determine its relative environmental impact. Using only natural fibers, spun and woven in a traditional way in England or Italy with the intent of standing the test of time, makes your suit significantly more likely to hold up and last you many years. 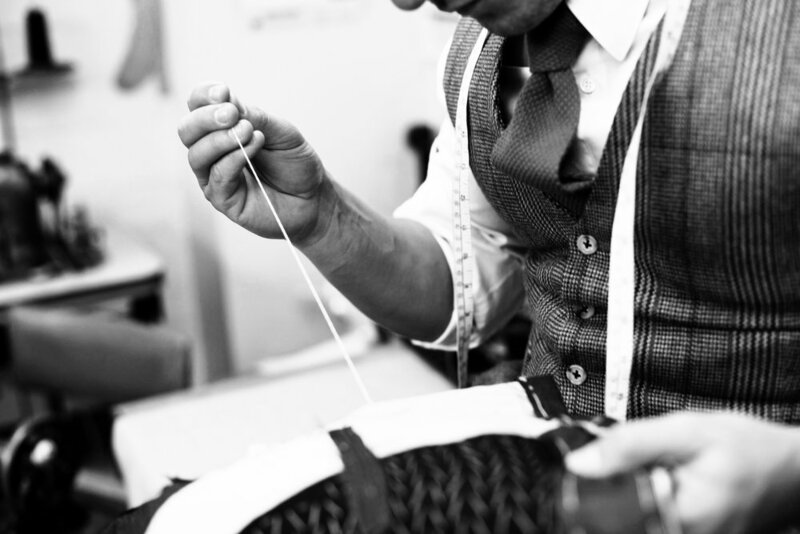 The hand-crafted construction of a bespoke garment will also serve to ensure longevity. Regular ready-to-wear garments are most often produced with fusing as the key shape holder, which is bound to fall flat over time. A hand stitched canvas where hundreds of small stitches mechanically holds the shape in place will instead keep the three-dimensional shape of your jackets and coats for as long as the cloth will last. You will notice that, if you take good care of your cloth, your wardrobe is going to fill up quicker than you are used to even with less purchases since the old staples will stay with you for as long as you need them. "Styles come and go over much longer cycles in the realm of classic menswear…"
Of course, there is fashion in classic menswear. The width of the lapels, the closeness of the fit, the construction of the shoulders, trouser lines etc. are all dimensions that will have a certain style that is “à la mode” at any give point in time. But with some level of carefulness you are able to navigate in a much more stable way than with the average garment from the shopping mall. Styles come and go over much longer cycles in the realm of classic menswear and thus by choosing relatively moderate expressions of the visible details and not being overly inspired with loud colours, you are safe to look great in a well cut suit over the different fashion eras. Instead you can keep up with time through the use of accessories and pairings with other garments such as shirts, ties, shoes and knitwear. As we have said in this blog before, a well-cut suit can be spotted from a mile away and the subtle expression of the three-dimensional fit of the garment will be of far greater importance for the impression you make on others than having the latest colour/model/brand of any RTW garment. That has even been proven in science. This makes the tailored wardrobe a lot more resistant to fads and trends, and thus in addition to the quality itself it significantly extends the life of your garments. 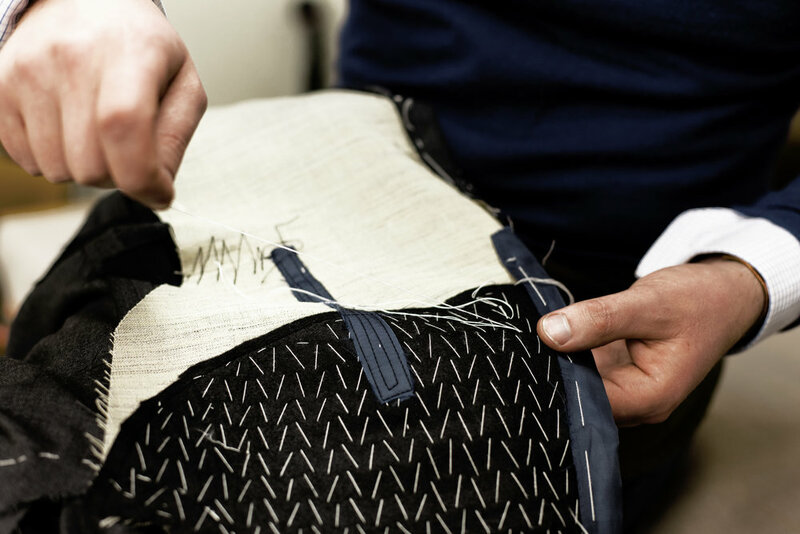 "When something has been made for you at Götrich, you can always come back for help"
What normally happens with clothes when seams start to come apart and buttons start to fall off? That’s right, they are sent off to the recycling bins. Anything you wear often, even with the highest of quality, will eventually start to look and feel worn. Typically, if you haven’t paid a lot for the garment and hence your emotional attachment to it is relatively low, you then feel ready to make a new purchase. But from something you have had tailored for you, that has been made by hand to your exact specification, it will be harder to let go. When something has been made for you at Götrich, you can always come back for help to preserve it and keep it in shape. If buttons need tightening, seams need to be remade, or if the fit needs to be somewhat altered to match an ever-changing body, we have the skill to do wonders with your clothes. This, naturally, is something retailers have a hard time keeping up with since their business model is based on fast consumption and quick replacements. The typical place where your suit starts to give in first is the fork, i.e. where your legs meet. This is due to the friction that arises when the cloth moves in opposite directions when you walk. It is easily fixed with a re-forking, i.e. reconstructing the fork with new cloth and replacing it in a way the isn’t visible to others (very few positions allow people to get a clear sight of your fork). "You never regret buying the real stuff"
There you have it, it’s actually quite simple. Investing in high quality garments, with a sense of classic style, through a tailor that can help you keep your wardrobe in a good shape will not only be a much more sustainable approach for the environment. It will also be economically sensible. Paying a small purchase price for clothes might seem tempting at first sight, but having to replace them quickly will immediately defeat the purpose. We know from experience, you never regret buying the real stuff. And to paraphrase the famous firefighter, “if your think it’s expensive to buy good quality, wait until you try bad”. 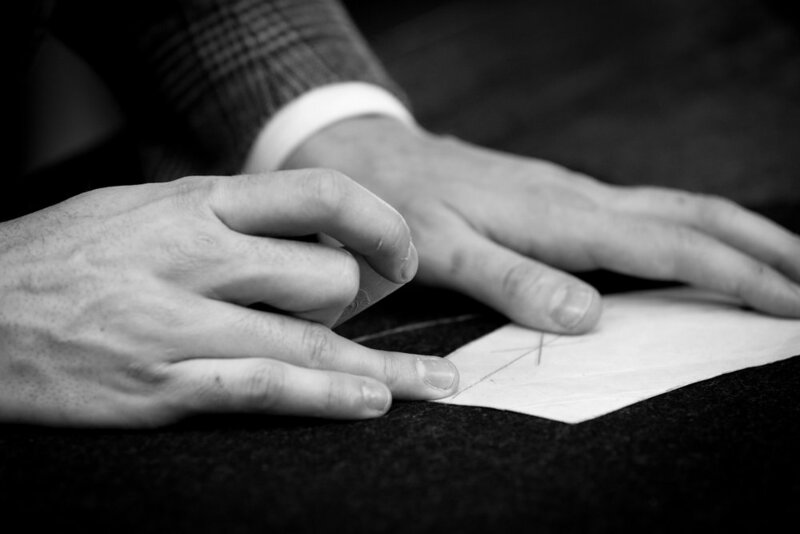 Book your consultation here to get started on your first, second or umptieth bespoke process. We are delighted to see you at Götrich!